DAVOS, Switzerland (AP) — Johannes Hoesflot Klaebo extended his dominating run in cross-country skiing’s World Cup with a 1.5-kilometer sprint win on Saturday — his sixth victory in seven events this season. 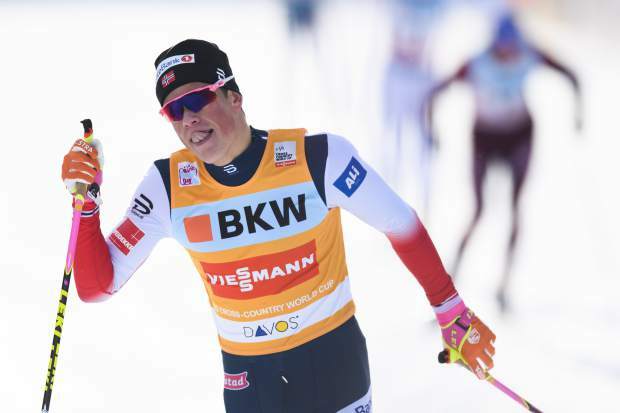 The 22-year-old Norwegian finished 1.80 seconds clear of Federico Pellegrino of Italy, and 4.64 ahead of third-place Alexander Bolshunov of Russia. Aspen native Simi Hamilton recorded his best finish of the season, finishing ninth overall. In the women’s sprint, Stina Nilsson of Sweden edged Norway’s Maiken Caspersen Falla by 0.08 seconds. Kikkan Randall of the United States was third, 2.53 behind Nilsson. Two more Americans raced in the final, with Jessica Diggins placing fourth and Ida Sargent sixth. With six wins before the turn of the year, Klaebo tied the World Cup men’s record held by fellow Norwegians Petter Northug and Martin Johnsrud Sundby. Klaebo earned 100 World Cup points to pad his overall standings lead to 284 over Bolshunov, who moved up to second. Nilsson used victory to rise to third overall, 108 points behind fellow Swede Charlotte Kalla. The Davos meeting continues Sunday with a men’s 15-kilometer freestyle race and a women’s 10-kilometer freestyle.